Matthew Roberts was a comfortable winner of the 3rd running of the Penrhyn Castle ParkRun on Saturday 29th November in a course record time of 16:20 (the previous record was held by Russell Bentley 16:47) Matt was 65 seconds clear of 2nd placed Owen Mitchell 17:25. Huw Owen also made the top ten finishing 6th in a time of 19:34. In all, there were 119 finishers. Eryri Harriers are well-represented in the selections for this years Inter-regional championships in Builth Wells on 13th December. Annabelle McQueen, Michael Spill, Gethin Davies, Bronwen Jenkinson, Becki Law, Hayley Turner, John Spill, Steffan Williams, Owen Roberts, Matthew Roberts, Andrea Rowlands, Louise Emery-Jones, Megan Hughes, Dylan Jones, Sandra Rowlands, Helen Blair, Ellie Salisbury, Stephen Jones, and Arwel Lewis have all been selected – not everyone can make it but still well done for their selection! This event also forms the Welsh Masters championships (which you don’t need to be selected for), so if you are a Masters athlete (35+) and would like to run, please let me know by Friday 5th December at the latest. Here is the link to the info. Last but not least – it’s Wrexham XC on Saturday and there’s still spaces on the bus – let me know if you’d like one. In the 2nd running of the Penrhyn 5k Parkrun on Saturday 22nd November, there were 6 Eryri Harriers amongst the 155 finishers with Dilwyn Rowlands leading the way in 16th place overall in a time of 20:54, an improvement of 15 seconds from last weeks inaugural race with Bronwen Jenkinson 19th in 21:18 and Eurwyn Edwards having a good run, finishing 24th in a time of 22:13, 43 seconds quicker than last weeks race. A bit further away, on the same day, Arwel Lewis who was a reserve athlete for the Welsh MV/55 team in the British & Irish Masters XC International at Wollaton Park Nottingham ran in the local Forest Rec 5k ParkRun and discovered that Nottingham is certainly not flat! In the hilly 2 lap course, Arwel finished 4th overall in a time of 20:32. There were 95 finishers. Many thanks to all who were able to come along – a great night had by all! Mike Lees the quizmaster was full of beans and the food/venue at Siabod Cafe (run by Eryri member Paul Hodges and team) was excellent as usual – we also had some very happy second place prize winners from Eryri Harriers too! The total amount raised for charity will be divided between Ogwen Mountain Rescue, Gwynedd and Anglesey MIND (mental health charity) and Alaw Ward at Ysbyty Gwynedd – all worthy causes. Many thanks to all involved and to all those people who donated money and prizes! 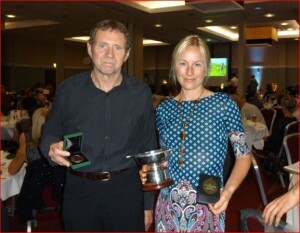 The Fell Running Association prize giving took place in Telford last night and saw Eryri well represented. Jackie took the British Ladies title sharing it with British International Victoria Wilkinson; two wins and a 2nd place each, the first Welsh winner since our own Angela Brand-Barker 20 years ago. Jackie also led the ladies to a fine 2nd team position, Jenny H and Wendy in Ireland, Serena and Kate in Scotland, and Andrea and Helen T at the Maesgwm Muddle, well done all. Pictured below are Geoff Fielding who came 3rd in the English O/70 and Jackie Taggart (nee Lee) joint winner of the British title. Around 2,500 runners completed the Conwy Half Marathon today which included a loop around the Great Orme of which someone should have warned Russell Bentley about!! Russell is more used to the flat terrain but still ran well to finish 3rd with a personal best time for the distance of 68:51. There was a sprint for the line between Mohammad Abu-Rezeq (Alrincham/Jordan) and Yared Hagos (Wallsend) with Mohammad having the upper hand to win in a time of 67:16, two seconds ahead of Yared. 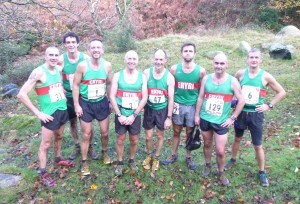 Eryri’s Jim Bacon was another to clock a PB time of 79:02 for 19th place overall with Arthur Connell 43rd in 1:23:37. The 1st female finisher was Kim Fawke-Williams (Centurion RC) 1:17:52 ahead of last years race winner Ali Lavender (Oswestry) 1:18:59 and Kelly Crickmore (Stockport H) 1:19:59. The well organised race consolidated its status as the biggest race in north Wales which was run in dry and but for a slight headwind on the way out and up the Great Orme, ideal racing conditions for the 6th running of the event. Lucky once again with the weather ! The preceding evening and night was extremely wet and windy so it was great to wake up and see clear blue skies and a favourable forecast. This year was the 40th anniversary of what is one of the most popular fell races in Wales . The nature of the course and its long history help contribute to its wide appeal – This year no exception with 250 pre-entered . 223 runners were set off by local town mayor Dafydd Borland and within 2 ½ hours , they were all back . One of the most “efficient” races in recent years ! Conditions were, apparently, surprisingly good underfoot given the recent wet weather. Local runner Math Roberts was unchallenged from the start, despite his various deviations from the route ( in perfect visibility !!). He took the win by a couple of minutes from fellow Eryri members Martin Cliffe and Dylan Jones. Similarly , in the ladies race, former winner Andrea Rowlands was five minutes clear of the others at the finish . The Aim for me every year is to continue to provide a value- for- money event with as much “profit” as possible going to local charities. This year we have been extremely lucky once again to be supported by : Haglofs UK ( prizes ), Pen Town Council, Capelulo Village Hall, X-Ray Mins , Conwy Brewery . Every runner received a bottle of finishers Ales and a hand made commemorative mug from Bentham Pottery. Huge thanks to our loyal band of helpers & marshalls – simply couldn’t run an event like this without them ! Special mention to the group of “Chefs” running from Saddleworth runners & led by Mark Brakespear . He rang me early in the year with this idea and so i felt totally happy that this was not a bunch of fun-runners who were going to cause concern by taking on the event dressed as chefs ( and chasing a lobster !!!!) . But, they planned every detail and had support in the shape of a hotdog stall erected at the finish providing “free food” …. but with donations to our race charity . So, thanks to them . I wouldn’t be keen to see lots of groups doing this in the future but these guys really did nail it & have everything covered ! Very much look forward to seeing everyone again in 2015 and … don’t forget that its always been pre-entry ! Come and support the club at the next fixture – the women’s open teams are currently 1st and the men’s open team are 3rd – we are doing a great job! Don’t forget it’s free to enter, there’s free transport and it’s free to be part of this great team event. Preliminary plans for the bus include first pick up at Parc Menai (LL57 4HJ) at 11am (TBC), followed by pick ups along A55, returning with to Parc Menai 5.30/6pm. Women’s race 2pm, Men’s race 2.45pm. Come along, join in the fun and raise money for Alaw Ward at Ysbyty Gwynedd, Mind (mental health charity) and Ogwen Mountain Rescue! Running-related and general knowledge questions, prizes and raffle. At Y Caban, Brynrefail – 7pm for food, 8pm meeting start. Always a good social evening as well as sorting out club business. Free hot food!